The king of our breeding program, Pita has produced daughters that always live up to our expectations. He is the tallest buck we have ever owned, and tied for height with some of the Kastdemur's boys we have been lucky enough to lease. He is long, dairy, elegant, and wide. When we kept him as a kid, on the advice of a very experienced breeder, we had no idea the impact that his dam and he would have on our herd. 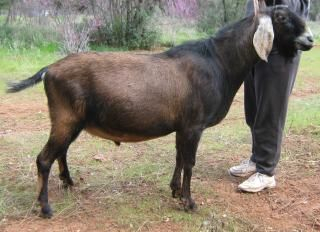 At the time we only knew that he had an incredibly wide flat rump for a Nubian kid, and that he was very upright and angular- in fact we had to build his registered name around his nickname...he has always been a mischievous pain in the- uhm- rear. 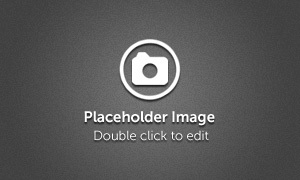 Luckily there is a beautiful resort in Bali named Pita Maha that we could use as his registered name! His daughters have been amazing so far- and the ones also on milk test have earned their Superior Genetics. His average daughter appraisal score is 86.7. 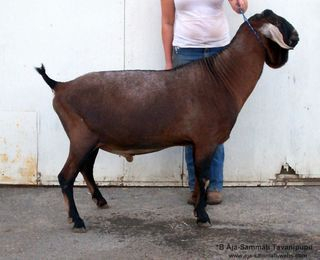 SGCH Aja-Sammati Psyche, at Theesfeld's Nubians in TX, is the first ever permanent champion we have bred and she appraised 91 VEEE at 4 years old. 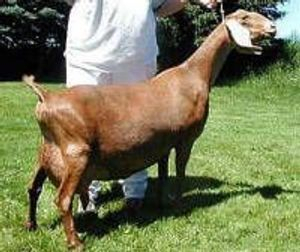 I wish we had realized Pita's worth earlier- he has not been bred to enough does that will have offspring on DHIR yet...though their owners report average production of 9-12 lbs a day. As one of our last living Babe offspring and on his worth as a sire, he will be around here the rest of his life, hopefully siring more beautiful does. When Ben saw a picture of Tyco as a kid, he was persistent in saying we should bring him home. Ben is seldom wrong, and Tyco is proving to be one of our best additions. We love Sandy's 'Z' line, and Beans (Zina), the queen of the herd was one of our favorites. 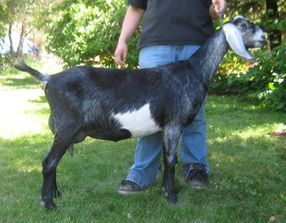 Tyco's kids have increased length of body over their dams, as well as beautiful breed character. They are stylish and have lovely mammaries. Tyco has placed well when we have shown him- earning one leg and also going reserve to a herdmate. He has matured into a lovely gentleman and he is still a vital part of our breeding plans. 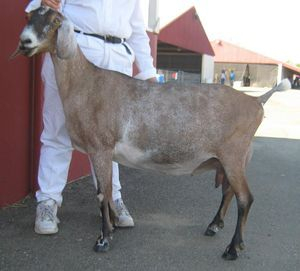 Pictured are his dam, Zina, and a mature daughter, Aja-Sammati Temperance. 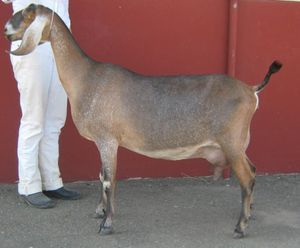 Shiyloh was a beautiful and strong doe, praised by several judges for her beautiful shoulders, front end assembly, and fantastic wide, flat rump. An appraiser once called her the "right kind of doe", and we couldn't have agreed more. She was the full sister to our herd queen, Babe (92 EEEE), and was excellent in her own right. 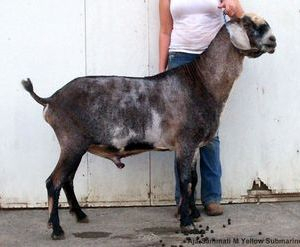 We look forward to using Dude's excellent genetics in our breeding program. Sub was saved for an export trip, and when it fell through he stayed to be used here...and we are so glad about that! His kids have been very wide and correct, with especially nice heads. We have not had very many daughters, but we really like the escutcheons and productivity of those we have seen in milk, as well as the improvement we see in pastern strength.